Last week, I was in Beijing for an international conference while the city experienced record levels of air pollution. I had a feeling of déjà vu as I saw people wearing face masks. Ten years ago, at the height of the SARS epidemic, a sea of people in white masks—most of them scared migrant workers and university students—flocked to train and bus stations and airports in the hope of fleeing the city. Then, face masks were a symbol of the fear of a deadly and seemingly omnipresent virus that was responsible for 349 deaths and over 5,300 infections in China alone. As the first severe infectious disease to emerge in the twenty-first century, SARS caused the most serious socio-political crisis for the Chinese leadership since the 1989 Tiananmen crackdown. Myth #1: Strong political commitment and a centrally coordinated response was the most important factor in the control of SARS in China. Myth #2: Those patients who survived SARS lived happily ever after. Not true. As a novel virus, SARS defied treatment and proved fatal in many cases. Zhong Nanshan, a Guangzhou-based doctor, initiated steroid therapy to treat SARS patients. This therapy, widely used during the SARS outbreak, was believed to have saved the lives of many SARS patients in China—indeed, during the 2009 H1N1 outbreak, steroid glucocorticoid was also used to treat critically-ill H1N1 patients. However, there have been adverse effects of this aggressive treatment. In late 2003, doctors began to suspect that the use of high doses of steroids for an extended duration was responsible for the crippling of hundreds of SARS patients. According to China Daily, roughly 30 percent of SARS survivors in China who received the therapy have developed severe bone degeneration. A study carried out in the Beijing municipality found that 88 percent of the SARS survivors had symptoms of osteonecrosis, 80 percent were forced to quit their jobs, 60 percent saw their families break up, and about 39 percent suffer from severe depression. Myth #3: Government cover-up is no longer a major concern in the post-SARS era. Not true. The SARS crisis has forced the Chinese leaders to take steps to be more open and transparent in disease reporting and information sharing. Yet as shown in the 2008 hand, foot, and mouth disease (HFMD) outbreak, local government officials found it difficult to adjust their existing behavioral patterns for crisis management, which still value secrecy and inaction. Similar communication problems also bedeviled the government’s response to the 2009 H1N1 outbreak. China’s SARS crusader Zhong Nanshan publicly expressed his distrust in government data on H1N1 fatalities. Political expediency continues to be put before epidemiological reality in sharing disease-related information with the public. 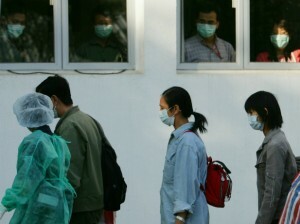 The health authorities stopped updating the spread of H1N1 cases between September 30 and October 9, apparently fearing that reporting H1N1 deaths would ruin the celebrations planned for October 1, the National Day that marked the 60th anniversary of the People’s Republic of China. That said, government cover-up and inaction are not unique to China; India’s response to the 2012 dengue fever epidemic was riddled with similar problems. Myth #4: Poor or failed states pose a bigger infectious disease threat to the international community than stronger developing countries. Not necessarily. In his thought-provoking book, Weak Links, my colleague and a leading global governance expert, Stewart Patrick, argues that stronger developing countries such as China and Indonesia “may actually pose a bigger infectious disease threat to the United States and the global community than weaker states.” In these countries, the rapid economic development and land use change has significantly increased the chances of human exposure to natural hosts who are carrying novel and lethal viruses of zoonotic origin. Coronaviruses that were implicated in the SARS outbreak, for example, have been detected in multiple species of bats. As described in the movie Contagion, the eating habits in some countries make it more likely for a virus to jump from one species to another. Indeed, In Guangzhou in southern China, 20,000 wild birds are estimated to end up in the human stomach every day. The integration of these countries into the global economy means that a lethal virus can travel at jet speed to other parts of the world. It is no coincidence that SARS was first discovered in Guangdong, a highly developed province with a robust export sector, and arrived in Toronto before it first appeared in Beijing. It also came as no surprise that Cambodia and Myanmar, two of the least developed countries in Asia, were spared by SARS in 2003. Myth #5: Infectious disease outbreaks remain the primary public health concern in the Asia-Pacific region. Wrong. According to the World Health Organization, non-communicable diseases or NCDs, which includes cancer, cardiovascular diseases, chronic respiratory diseases, and diabetes, are the most frequent causes of death in most countries in the region. Today, NCDs account for 85 percent of mortality in China and 70 percent of total disease burden. Indeed, even in sub-regions of Asia-Pacific that are still facing the double burden of communicable and non-communicable diseases, NCDs will soon be the predominant cause of mortality. According to the World Bank, the share of total deaths attributable to NCDs will increase to 72 percent in 2030 from 51 percent in South Asia in 2008. Since 2003, tremendous progress has indeed been made in improving global health security, especially in areas of capacity building for disease surveillance and response. However, our ability to effectively address the next SARS-like disease outbreak is still constrained by our lack of understanding of the evolving biological and political worlds.